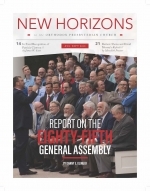 After the United Reformed Churches in North America (URCNA) was formed on October 1, 1996, members of the Orthodox Presbyterian Church, especially senior saints, sympathized with the new federation’s courageous stand for the straight teaching of the Bible. The Trinity Psalter Hymnal is hereby presented to the church to aid her in fulfilling the mandate of Psalm 150:6: “Let everything that has breath praise the Lord!”—Father, Son, and Holy Spirit, who created and sustains all things, and who is, from first to last, the one who grants eternal salvation. All praise, honor, and glory be rendered unto our great and gracious God for all that he is and has done, particularly for the Father bringing his own from death to life by the person and work of the Lord Jesus Christ, in and by the power of the Holy Spirit, through all the appointed means. And singing his praise forms no small part of that worship that we render to him in the appointed means of Word, sacraments, and prayer.